Marine toilet installation in FISHERS HORNPIPE (Groco Skipper). I have pondered the question of optimum head location for many years, always being less than happy with most traditional arrangements. Having lived on sail and power boats intermittently since the 1950’s, I think I have experienced most of the possible choices for location and type of marine toilet… and they have all been dreadful! Whether the head is tucked way up in the fo’c’s’le, tacked onto a stateroom, or placed in the saloon close to the cockpit, it tends to stink up the entire boat. Sea water combined with human waste exacerbates the smell with tiny organisms which go ballistic in the marine toilet, plumbing, holding tank, and (worst case scenario) bilge. Hatches, portlights and vents just never seem to solve the problem. 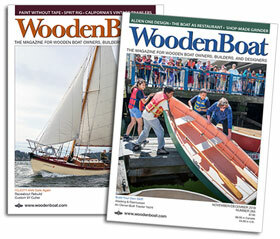 In traditional wooden boats, the head and shower, if one is included, comprise the ideal “rot-starter” kit. Water condenses, fittings leak, hoses drip, and rot happens. And the resulting smells are even worse! 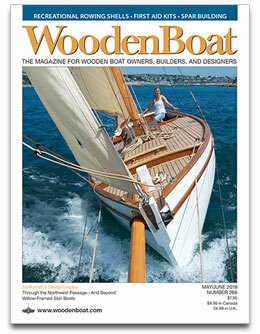 Even in cold-molded wooden boats, the head area is often the most likely candidate for problems. Having designed, built, lived on, and cruised in six personal sailboats, I have tried various solutions to “where to put the damn head.” In my first boat (FISHERS HORNPIPE), I put it at the bottom of the companionway to the great aft cabin, within easy reach of the center cockpit. This worked, but provided poor privacy, being in the highest traffic zone, and right across from the galley. In my second boat (TERESA), I put the head in the forward sleeping cabin, also directly below the companionway. That was better—somewhat smelly at night—but at least it was separate from the saloon, galley and eating dinette. In my third boat (the 1926 Alden Malabar Junior IMAGINE, which I restored), the head was an antique that I rebuilt, in its own tiny cabin in the saloon. It stank! For my forth boat (LEOPARD), I again located the head in the forward sleeping cabin, immediately below the companionway; this was the largest of my heads—it even had a sliding door, a large skylight, a big stall shower, and was located well away from the four fo’c’s’le berths. It was good, but LEOPARD is a big boat. The Pilot Schooner 60 LEOPARD’s Plan & Inboard Profile, showing the head to port in the forward sleeping cabin. But in my fifth boat (T’IEN HOU), I hit on the solution: I was determined that the head should not be inside the boat… so I put it in the cockpit! This was certainly an unusual and somewhat controversial head/shower location. T’IEN HOU has a center-cockpit/pilothouse, located between the main saloon and the master’s aft sleeping cabin. I placed the head in a separate well lower than the cockpit, such that you step down into the head (it still has 6 feet standing headroom). The head and shower are therefore in their own small cabin, about the size of a large phone booth, or a small outhouse. The first and foremost reason for this choice was to completely eliminate disagreeable odors inside the boat! And it worked! No head odors whatsoever permeate any part of the interior. The Lorcha 50’s Plan & Inboard Profile, showing the head location to starboard in the cockpit (dashed lines in the profile view). In the Plan View drawing of T’IEN HOU, the head is located just aft of the helm seat, in a central location convenient to every part of the boat, but especially to the aft sleeping cabin, cockpit/pilothouse, and main saloon. Crew members from the fo’c’s’le admittedly have a bit of a trek to reach it, which could be solved by installing a second head in the cargo hold (something I would never do). I simply cannot embrace the practice of installing more than one head in a modest-sized cruising boat. The author sitting at T’IEN HOU’s helm—head compartment to right. The shower can be used in the head compartment or in the self-draining cockpit, using a handheld shower on a hose with two mounting brackets—one inside, one outside. I rig a shower curtain from hooks under the hard top for modesty when using the outside shower. This head location also provides convenience for single-handing: Even in the ICW (Intra Coastal Waterway), running on autopilot, the helmsman can duck behind his chair and use the head, looking out occasionally to see if all is well. On previous boats, I had to keep a 5-gallon bucket near the helm, an unsatisfactory arrangement at best. The shower drains directly through the scuppers (when used in the cockpit), or into the engine room sump (when used inside). There is no need for a gray-water sump, holding tank, and attendant pump to void it. This last is a great savings in space, mess and expense, as well as maintenance. Another big advantage is proximity to the hot water heater (12 inches away under the cockpit well, directly forward of the head compartment). An absolute minimum of time (3 seconds) and water (1/8 pint) is wasted waiting for hot water to reach the showerhead. T’IEN HOU’s 5-gallon water heater is plumbed to the diesel (18 inches away) via a heat exchanger. This arrangement could not possibly be more efficient. As regards the head itself: The best of all marine toilets in my 50 years of hard-won experience is the Sea Land Traveler, which has only one moving part (a pedal which rotates a large ball valve while opening the water inlet valve), never fails, never plugs, and (so far) never has to be rebuilt! The only drawbacks are that this toilet discharges directly into a holding tank (by gravity), and that it requires a pressure-water feed. A Sea Land Traveler marine toilet installed directly above the holding tank in the 45-foot sharpie schooner IBIS. While the Sea Land Traveler is intended to be installed directly onto the holding tank, I have had success in plumbing the head discharge using 2 ½″ PVC pipe down into a remote holding tank in the lowest-available portion of the hull or box-keel. Use no elbows or connectors—nothing must restrict flow. Where necessary (directly under the head), bend the pipe very gradually using a heat gun—or use a sweep. Do not kink the pipe! Discharge directly into the top of the holding tank. Install a 1″ PVC pipe vent as high and far aft as possible, and you will almost never smell your holding tank (add deodorant anyway). Install a Whale Gusher hand pump using 1½″ odor-proof sanitation hose to empty the holding tank. Also, install a deck fitting for marina pump-out facilities. Locate the pump discharge just at or below LWL using a 1 ½″ schedule #80 PVC ball-valve and Delrin thru-hull. T’IEN HOU’s head, with first mate Delfine’s toes (Reuel’s Angel #1). I know there are people who will have objections to this head location. I know there are those who are so embarrassed by their body functions that they dread to be witnessed using any toilet, and are horrified at the thought of someone being within sight or sound of them while doing so. There should certainly be a door to the head, or at least a really good curtain (I prefer the latter). Life on a cruising boat is always intimate, and personal adjustments must be made. Some people simply may not be suited to the lifestyle. Finally, as a life-long live-aboard cruising sailor, I think this head location is really perfect, and I think any real sailor will agree—if not immediately, then certainly after using it for a week. Try it—you’ll like it! And I freely admit right here that, 50 years ago, I used to be one of those unfortunate people described in the previous paragraph. I got over it (thank goodness! ).